We have two sides of the same stone here, if you will. Both come from the excellent Italian maker Tanfoglio (say it like this: Tan-foe-glio), residing in the heart of Italian gunmaking, the Brescia region. Pause for a moment and ponder the fact the steel mined in the region was used to build Roman swords and has been used to build guns for centuries. All the same steel, the same mines, mined by the locals — for centuries. When I realized this, it changed the way I felt about the all-steel Stock III Xtreme. Think about it. Is some small part of the Roman sword magic lurking inside each Tanfoglio gun? I like to think so. So, back to today. Is one of our attractive Italian duos solely for defense while the other sneers at anything other than competition? Could either do both? Yes … or no? “Si, certo!” … or “Per nulla!” Would we ask too much to simply appreciate the polished form of the Stock III Xtreme as a competition pistol? Would it be rude to automatically allocate a place on the defensive side of things for the Polymer Carry? Is it okay to think outside of the box here? The Stock III Xtreme in 9mm we have here is specifically made to tackle the chores associated with the Production Division in IPSC. The somewhat fanciful shooting game showcasing speed, accuracy and clear-thinking demands reliability, precision and dynamic ergonomics — which the Xtreme delivers elegantly — and without fuss. While I’d like to extoll you with battle-weary stories of my conquests in the IPSC field of competition, I simply can’t. Other than playing at it with some gusto in the early days of the middle to late 1970s and into the very early 1980s (local club stuff), I haven’t ventured there in, oh, let’s say 35-plus years. So what qualifies me to write about the gun? Because, simply put, this is a handgunner’s gun, and if you appreciate fine workmanship, gilt-edged accuracy and a trigger you’ll lose sleep appreciating — the Stock III Xtreme’s magnetic attraction will snare you. It did me. Trainers sometimes say things like, “Advanced tactics are just the basics, applied” — and they’re exactly correct. If you know how to press a trigger well, if your gun-handling skills are up to snuff, you’ll immediately “get” the Xtreme. When you pick the gun up, your mind’s eye will begin to run plate racks, take precision single action shots at 50 yards and you’ll “feel” it come out of the holster — snick. You’ll also sense how the low angle of attack the slide manages — sitting huddled in the frame — will help tame recoil recovery. The gun writes a story just being held and the continuous loop video plays when you pick it up. Every time. Of course, there’s also the competent but attractive copper ceramic coating. Call it eye candy if you must, it’s nonetheless an intermediary for an extensive series of reasons why this pistol sells so well. From competitors demanding the best, to we mere mortals, we all admire its features and benefits and wish to call them our own. At $2,364 MSRP, it’s priced what a “custom” 1911 used to be priced 20 years ago. Which means in today’s dollars, it delivers the same relative value as a $5K or $6K custom 1911 does as the clock ticks now. Lest you think I’m trying to fool you (“Hey, that’s a factory gun, not a custom gun!”) keep in mind something important. The Stock III Xtreme is chock-full of custom parts, each hand-fitted by master artisan-gunsmiths at Tanfoglio. It is a custom gun. The custom touches read like the wish-list of a top competitor for their “dream” pistol — because it is. Six-time world champion Eric Grauffel’s demanding requirements for a top-competition pistol sees the light in the Stock III Xtreme. The barrel — with polygonal rifling — full-length dust cover and rail, ceramic coating, ambi-safety, aluminum grips, Xtreme Hammer, Xtreme Guide Rod, Xtreme Front Sight with fiber optics, custom mag catch, large slide serrations and a tuned trigger from Tanfoglio’s Custom Shop — all come with a certificate signed by Eric guaranteeing this is the real deal. So Eric, who “owns” the game, designed this gun to meet his exacting needs to keep raising the bar and winning over and over again. We should pay attention, then, shouldn’t we? The pistol is a DA/SA design, with the “usual” ability of this CZ-inspired design to work “cocked and locked” or with the safety off and in the DA/SA mode. Beware, there’s no “hammer-dropper thingy” and IPSC rules dictate the guns have to start in the DA mode, so any hammer-dropping needs to be done safely. Can you say disqualification, if you don’t? Oops. The sights are adjustable to take advantage of the Xtreme’s ability to shoot “little tiny groups” with its 4.5″ barrel, and the 17-round mag (in 9mm) keeps you shooting when others run dry. Available in .40 S&W too, the mag capacity there is 14 and both calibers come with four mags. Overall length is 8″, height is 5″ and width is about 1.4″. Weight is a substantial 45 oz. (about 38 oz. or so for a steel 5″ 1911 for comparison) but this weight makes it a delight to shoot. The safety is ambi, and the mag catch is extended but can’t be swapped from side to side (although some try with modest success evidently). The barrel is slightly “bull” and the slide has no separate bushing. It also has a full-length guide rod. The mag well comes beveled, the obligatory beavertail is high and comfy, the backstrap and frontstrap are checkered and the big grip is surprisingly workable even with my medium-sized hands. The slim aluminum grip panels help a lot there. This latest iteration of a long-line of competition-based Tanfoglio designs sits comfortably in the hand. Once in SA mode and the not-inconsiderable take-up is out — faster to stage that way? — the break is clean and surprises every time. Mine measured a rock-solid and repeatable 3 lbs. SA and right at 8 lbs. in DA mode. This, my friends, is what a well-tuned PPC revolver or slicked-up Python can do after being worked over by skilled hands. Can you say smooth? I ran some plate racks just to remind myself why I don’t compete. But it was still great fun and since I know my way around shooting a handgun, good trigger skills paid off. Using a very nifty and easy to set up MGM “Steel Challenge Rack” (comes in a steel bucket and you just need three 2×4’s to get it going), the “tink, tink, tink” kept up and at 15 yards I rarely missed even going at what I’d call a “pretty good clip” for this old guy who mostly can’t see anymore. Even wife Suzi said, “Hey, you can still do that?” Why did she sound so surprised? Target accuracy really got my attention. I’ve heard of these guns going into 1.5″ or so at 50 yards with the right load and some talent on the gun. At 25 yards, with a semi-blind old guy on the trigger, I seemed to hover around the solid 1″ to 1.5″ and it ate up everything I fed it. It just perks along and the weight and good ergonomics makes it just plain fun to shoot. I’ll bet if I could get an optic on this Stock III Xtreme the magical 1.5″ at 50 is easily attainable. I came away very impressed with its shootability and predictable accuracy. It reminded me of the Witness Elite Gold we tested (Handgunner, Sept/Oct 2013), also having a great trigger and scary accuracy. The family history shows. I can see why the Xtreme is the darling of the Production Division and frankly, also qualifies as a perfectly sound home defense gun too. Protect all week, compete that weekend. This answers the question posed earlier: “Si, certo!” It can do both. 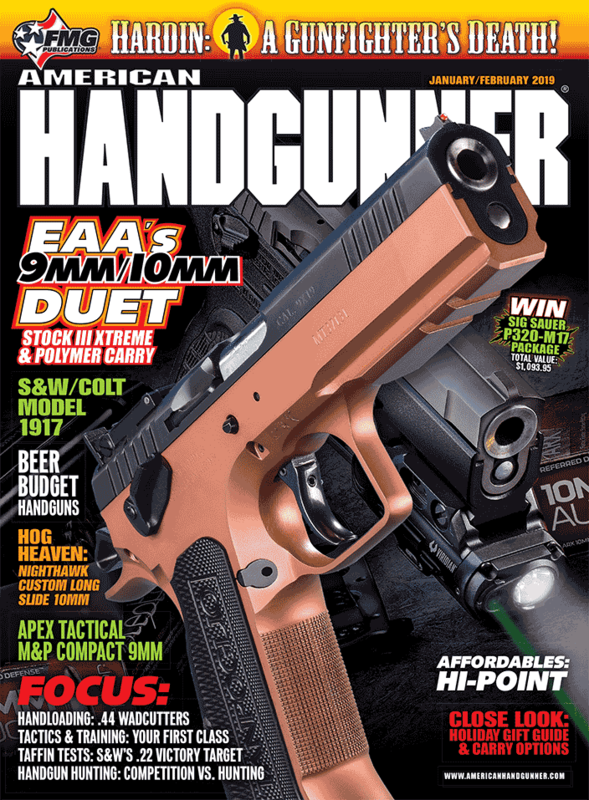 I wanted to balance the “all-competition, all the time” side with a more pedestrian, affordable “daily” gun and Paul Richter at EAA said, “That’s easy, get a Polymer Carry.” The thing about this model is its versatility. Witness Polymer pistols can all be converted to .22 LR, 9mm, .40 S&W, .45 ACP and even 10mm (like our test gun) with “kits” available from EAA. They say a caliber change needs fitting by a gunsmith and this makes sense, but for the cost of the bits, you have a new caliber in the same gun. Kits are sold on EAA’s website. I actually asked for our test gun to be changed to 10mm, as it began life as a .40 as I recall. I wanted to see what it was like to turn this polymer (29 oz.) defensive gun into a hand-canon. The 3.6″ barrel, 14+1 capacity (10mm), 7.5″ OAL and 5.5″ height make it doable for EDC, home defense and yes … even weekend club IPSC type competition. Shoot what you carry, eh? At a full MSRP price of $711, I’m suspecting it’s more affordable at your local dealer, making it and the idea of easy caliber conversions tempting. From my understanding, it’s essentially the same mechanics as the “Xtreme” family (based on the CZ-75 design), but without some of the custom and fussy touches. This is a working gun, built tough with attention to keeping things affordable and functional. The double-stack grip is slightly smaller around than the Xtreme and has no grip panels. The action is the same DA/SA design with the same safety set-up. But I’ll confess the controls on the Xtreme simply worked more smoothly and felt “better” due to the hand-fitting and parts design. No surprises there since one costs more than three times as much as the other. The SA trigger pull on the Polymer Carry tripped right at 4.9 to 5 lbs. with some creep. But I’d call it virtually identical to most polymer guns I’ve shot over the years. It’s a workable trigger and would likely slick up a bit with use. The sights are fixed, adjustable for windage and easy to see. The barrel is a bushingless set-up (cone-shaped) with a full-length guide rod, mated to a “compact” slide on a full-sized frame. I kept picking it up on my desk, hefting it, pointing it out my window at my plate rack outside and I kept thinking, “I feel well-protected with this gun.” If there was a bump in the night, I’d feel perfectly fine taking the Polymer Carry along with a light on the rail to check things out. Well, along with the two Aussie Shepherds here to bark and act like they own the joint. Okay, this surprised me. I’ve fired lots of 10mm rounds but mostly in “Big, Heavy, Guns.” I’ve always thought, “Hey, what’s the big deal here? Recoil isn’t bad, it’s easy to control, about like shooting a hot .45 load.” But … shooting SIG’s 10mm 180-gr. V-Crown JHP got my attention. It’s fine, controllable even, but it does thump and you’re reminded this is not a 9mm or even a .45 you’re shooting. I chronographed it and it delivered in the vicinity of 1,245 fps or thereabouts from the test gun. That, my friends, chases some lighter .41 Magnum loads and makes this Polymer Carry a real fight stopper in anybody’s book. I put about 200 rounds of various 10mm loads through it and it ran fine with them. I did take the time to clean and lube it prior to shooting. Hey, give ’em a chance, I always say. My “semi-old-guy” wrist was tired at the end though. I did note the gun shot about 10″ low at 15 yards with the 10mm, which might have something to do with the fact it was originally zeroed for the .40. We’d need to explore sight options if we kept it in 10. Groups at that same 15 yards were in the 2.5″ size range, but unlike the great, adjustable sights on the other gun, my “challenged” eyes fought with the fixed sights on the Polymer Carry. And I’ll confess the whack of the 10mm kept surprising me. But lord, it was fun to shoot. On steel it was “Bang, CLANG!” Of course, keep in mind with a parts swap, you suddenly have a 9mm, or even a .22. It’s not fancy, but it’s solid, predictable and could most definitely protect you. It’d give you some weekend sport in a club match, take down a mean wild boar if needed and even lend a hand with some weekend .22 plinking using a caliber change-out. It’s a sort of “everyman’s” gun and deserves a good look if you’re in the market. It seems our little experiment played out okay. The Stock III Xtreme is everything I had hoped — accurate, well-made, elegant and a great value for what it does. Flip the rock over and you get highly functional, affordable, versatile and reliable in the Polymer Carry. A kind of “do-everything” gun for EDC. Those Italians just might know a thing or two about gun-building, and EAA has the good sense to bring them to us.